On October 29, 2014, my wife Ruchi and I visited the recently constructed hostel in Katni, Madhya Pradesh, which opened its doors in July 2014. We were excited to see how this project was progressing. We took an overnight train from Delhi to Katni, close to 12 hours journey, but seeing the hostel in person was something that meant a lot to both of us. When we reached Katni, we were warmly greeted by Swami Aishwaryanandaji at the train station. After reaching the hostel and quickly freshening up, we were ready for a tour of the hostel – and its’ facilities. The hostel was beyond our expectations. 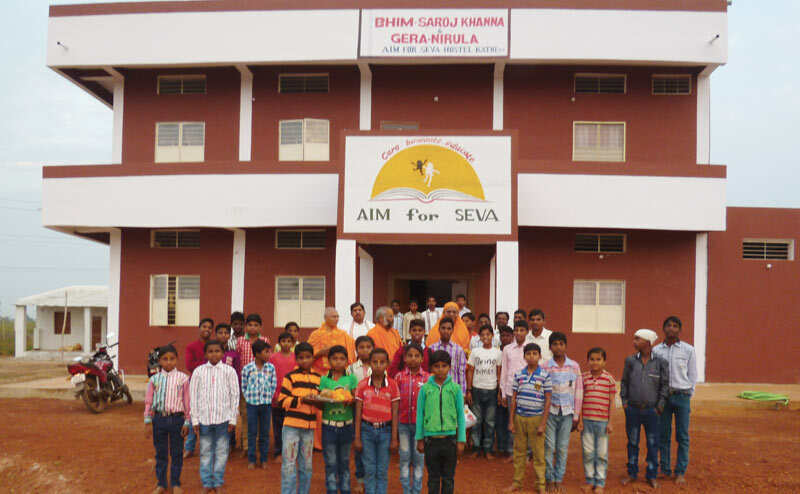 It has been named “AIM for SEVA Chatralaya Bhim-Saroj Khanna and Gera & Nirula.” It is located behind the Government Higher Secondary School in Majhagavan on Shahadol Road in Katni. At the hostel, we were greeted by students with open arms and garlands; it was overwhelming to be treated with so much warmth, respect and kindness. We met with 35 young boys ranging between the ages of 8 and 14 who live at the school full time and receive education, food, and lodging. They wear school uniforms – high school boys wore yellow shirts and the younger boys wore blue shirts. After a brief tour and some photos, Swamiji conducted Pooja ceremony to officially open the Chatralaya. Afterwards, we chatted with the young boys about their sentiments about living in the hostel. They all emphasized how excited they were to be living at the hostel and the opportunities that receiving the education afforded them. Ruchi and I participated in a question and answer session in the open hall in the hostel. It was encouraging and fulfilling for us to see that these boys were looking forward to their future, which for most of them was higher education, to become doctors, engineers, and forest officers. Each child’s dream was unique and it was a humbling experience to see each of these young boys literally “AIMing” high due to the Organization’s efforts to bring educational opportunities into rural areas. Each and every student expressed their utmost gratitude regarding their inclusion at the AFS hostel. It is one thing to write a cheque, but to see those dollars making an impact right before your own eyes is an ample indication of importance of the work that AIM for SEVA is doing in these communities. Udal Kumar, one of the students, presented us with a beautiful drawing of the hostel that he had created. That drawing now hangs on a wall in our office. Before taking our return trip to Canada, we had also managed to raise some additional funds. These funds allowed us to provide a backpack and a sweater to each student and desktop computer-printer for the hostel. This hostel is just the beginning. We hope to be involved in the cause and continue to support AIM for SEVA. Investing in the well-being of our children is investing in the future which is priceless. We want to thank Gera & Nirula and other donors who donated funds for this hostel and made it a reality.